ab8344 gave a positive signal in human, mouse and rat kidney tissue lysates. In Flow Cytometry, this antibody gave a positive signal in methanol fixed/Tween permeabilised HepG2 cells. Our Abpromise guarantee covers the use of ab8344 in the following tested applications. WB 1/500. Detects a band of approximately 45 kDa (predicted molecular weight: 35 kDa). Belongs to the X(+)/potassium ATPases subunit beta family. Overlay histogram showing HepG2 cells stained with ab8344 (red line). The cells were fixed with 80% methanol (5 min) and then permeabilized with 0.1% PBS-Tween for 20 min. The cells were then incubated in 1x PBS / 10% normal goat serum / 0.3M glycine to block non-specific protein-protein interactions followed by the antibody (ab8344, 1/100 dilution) for 30 min at 22ºC. The secondary antibody used was DyLight® 488 goat anti-mouse IgG (H+L) (ab96879) at 1/500 dilution for 30 min at 22ºC. Isotype control antibody (black line) was mouse IgG2a [ICIGG2A] (ab91361, 1µg/1x106 cells) used under the same conditions. Acquisition of >5,000 events was performed. Publishing research using ab8344? Please let us know so that we can cite the reference in this datasheet. The human cells are isolated from blood, sonicated in Relaxin buffer containing protease inhibitors, then subjected to a saccharose gradient to separate the membrane. The protein is loaded on a gel. The membrane in blocked in Oddysey Blocking Buffer and the antibody is incubated overnight at 4C in PBST. No bands are observed. I can confirm that the laboratory has stopped using the Oddyssey blocking buffer as it gave a number of signal problems. We recommend to use 5% BSA or 5% milk, and both should work with the Oddyssey machine according to the lab. Can you please clarify whether the protocol of sucrose gradient is used with other proteins? I'm wondering if this step may be damaging the protein Sodium Potassium ATPase? If you still experience problems with the new blocking step please do not hesitate to contact me. I am interesting in buying an antibody that is specific to Sodium potassium ATPase, that is specific to a peptide of this protein that lies within the cytoplasm. I believe that most commercial ATPase antibodies are specific to regions that are exposed on the cell surface. Do you know whether one of your antibodies actually target the internal face of the plasma membrane? We are working on CHO cell lines, doea this antibody recognize Sodium Potassium ATPase on CHO plasma membrane? Thanks for your time and reply in advance. 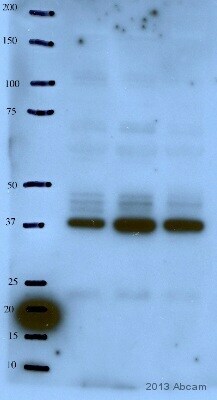 This antibody has been shown to cross react with Cow, Dog, Human, Pig and Rat. I'm afraid that, to our knowledge, it has not yet been tested in other species, so I do not know if it will work with CHO cells.